National Peanut Butter and Jelly Day is celebrated on the 2nd April. If you love the classic combination of peanut butter and jelly, then this is going to be your favourite day! This is also a great chance for companies to make their brand relevant in a fun and exciting way. A smart marketing move is to largely promote related products like bread and milk, along with the star of the show – peanut butter and jelly. One way to do so is to provide a Custom Promotional Gift with Purchase – Promotional Plush Toys, Lunch Box, Keychains, etc. Offering such marketing Gifts with Purchase will definitely attract the attention of PB&J lovers! Customizable Keychain: Seen below is one of the best promotional keychains you can offer to children. 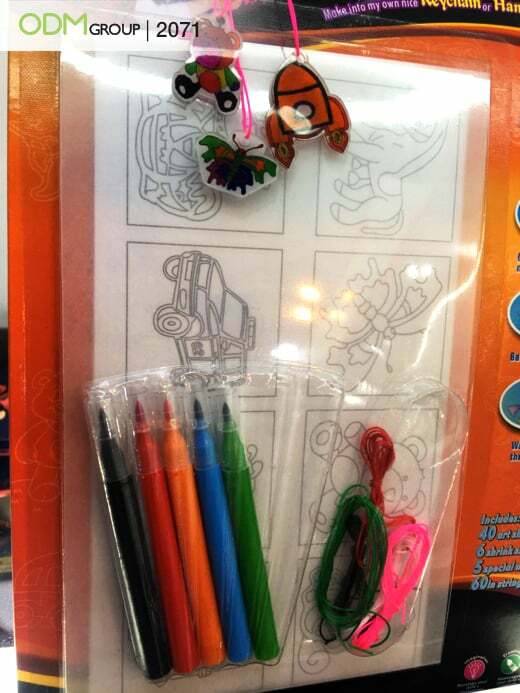 Users can colour their chosen design and cut it out to create their very own promotional keychain. This allows them to add a personal touch to their beloved keychains – making it very fun and interesting compared to competitors’. 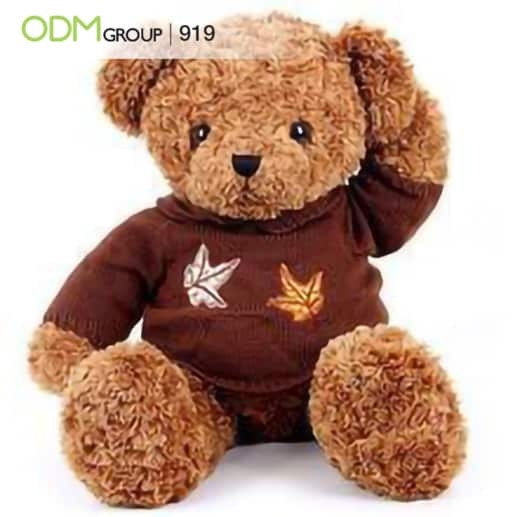 Promotional plush toys: Make sure to spice things up by customizing your plush toys to stand out from your competitors. You could have promotional plush toys in the shape of a sandwich or peanut butter container, with a built-in speaker that consumers can connect via Bluetooth to play music. Custom Shape USB keychain: Similar to the promotional plush toys, offer consumers fun and interesting USBs with unique and quirky designs to tie in with your promotional campaign or event. For example, you can have the usb in the shape of a jar of peanut butter or jelly. To further amp it up, you could implement a built-in torch light. Our example below is a custom-shape usb in the shape of a leather belt. For this occasion, why not brand the leather cover with your message? How Free Promotional Gift with Purchase Can Help Brands Stand Out? Differentiation: It is important to create distinct GWPs and differentiate yourself from your competitors. You can spice these Promotional Gift with Purchase up a little. The tips as mentioned above is great to implement. Feel free to let your creativity run! Brand Collaboration: Collaboration of 2 brands will increase creative levels. This also gives you a higher chance of creating something unique through the merging of different styles. On top of that, an iconic brand collaboration will have a larger customer base and product exposure. Loyal customers of both brands will be interested in the collaboration. Not only so, but it will also catch the attention of those within the industry. Promotion: It would be useless if brands create amazing Promotional Gift with Purchases but keep them in the corner of the supermarket/store. It is crucial to get the word out to your target audience – word-of-mouth, social media, television, etc. Increase brand exposure by reaching your audiences through various means. Use Instagram, Pinterest and Twitter to target youngsters, and Facebook to target the middle-aged. Don’t forget to use hashtags! It will allow consumers to easily find you on social media sites. Increase brand visibility: With proper planning and execution of this marketing scheme, your brand’s visibility will skyrocket and be the talk of the town. People are more likely to notice your brand if you have fun and interesting Promotional Gifts with Purchase that reflects the occasion. Consumers will be talking about the promotion, and be eager to redeem it after their purchase. Boost Sales: There is something about free gifts that always make customers excited. They will be more willing to make the extra effort to purchase the items. Sales will always surge when there are promotions – which also includes the complimentary gift with purchase. Capitalizing on quirky celebrations gives your brand a huge marketing edge because the novelty of the celebration and the products you offer really appeal to the masses. Highly Customisable: There is no rule as to how you should design your Promotional Gift with Purchase. It can be designed in any shape, form, size, colour, etc. You should customise it to represent your brand well, such as using the same colour theme as your logo. Furthermore, you can let others know a little more about your brand when you have something that represents part of your company. Our key takeaway? Making use of observance days is one way brands can expand into other target markets and increase their brand exposure. Other quirky observance days in April include National Grilled Cheese Sandwich Day and National Cheddar Fries Day. Keen on making a one-of-a-kind Promotional Gift with Purchase for your brand? Contact us today to learn more about how this can vastly improve your business. Our product designers will be able to provide you with fun and interesting ideas to stand out from the crowd. Moreover, our specialists will be able to assist you every step of the way, from designing all the way through manufacturing. ODM has an experienced team that will ensure you a simple process and pleasant experience. Keen to find out more examples of Promotional Gifts with Purchase? Check out our other blogs! Havaianas took their Christmas offer to a new level with this Trendy Promotional Toiletry Bag. Why do we love this idea? Why is this Free Promotional Item successful? Click below to find out more! Custom Cheese Knife Set As A Promotional Gift To Thank Customers! Sensory marketing is an effective way to gain your customers’ trust. So why not use these ideas for your next PB&J promotions? Food Promotional Gifts Have the Wind in Their Sails!